It has been a long standing mystery how the start of puberty is initiated. Fact is that menarche, the begin of active reproduction capacity is preceded by and a consequence of the adrenarche, the begin of androgen production in the adrenal gland. Puberty is characterized by the beginning of sporadic gonadotropin releasing hormone (GnRH) pulses which in time become regular and finally acquire their one-in-two hour rhythm at the end of puberty. A report in the Journal of Molecular Endocrinology by Abreu and colleagues from Boston and Sao Paulo has uncovered that the Makorin ring finger 3 (MKRN3) gene is mutated in cases of central precocious puberty (CPP) . CPP is diagnosed when the children enter into puberty much to early for their age. They analyzed the protein in more detail then and found the decline of MKRN3 expression in the arcuate nucleus (area of the hypothalamus to control GnRH secretion) is necessary for the increase of GnRH secretion. Without GnRH puberty can not take place. By which stimulus the decline of MKRN3 is initiated has not been described. It is discussed whether MKRN3 acts directly on GnRH secretion or on kisspeptin, neuromedin B or dynorphin, known mediators of GnRH secretion. It can not act on GnRH expression since the GnRH neurons only reach with their axons into the arcuate nucleus where their release is controlled by other neurons and mediators. This is a nice paper, adding valuable information to people concerned with the mechanisms of puberty. Recommended! T lymphocytes require education in order to distinguish between self and nonself. This education is maintained by thymus stromal epithelial expressing the autoimmune regulator gene (AIRE). These cells express proteins from throughout the organism not in promotor regulated way, but in a epigenetically controlled statistically mode, the only cells that do so. This has as a consequence that these cells present on their surface each a part of the possible plethora of self peptides in the context of MHC class I molecule. T cells which react with them do recognize self and should be suppressed lifelong to avoid autoimmunity. autoimmune polyglandular syndrome 1 is the consequence. The News and Views contribution by Tanaka and Sakaguchi explains this in detail. This is a nice addition to the problem of tolerance and and might be an important step to development of tolerance to foreign antigens as well. That would be required to make gene therapy sustainable. Almost all the physiological actions of angiotensin II, the effective mediator after renal renin has cleaved the precursor angiotensinogen and the angiotensin-converting enzyme (ACE) of the lung has liberated angiotensin II from angiotensin I, are mediated by by the angiotensin II type 1 receptor. It is a G-protein coupled receptor (GPcR) like many hormone receptors of the rhodopsin family (Omin 106165). Like many GPcR it has been difficult to crystallize to dertermine its threedimensional structure. Zhang and colleagues from Los Angeles and other places have now used femtosecond chrystallography to reveal the structure with the high-affinity agonist ZD71DD as ligand. The depicted image is nothing compared to the images in the paper. 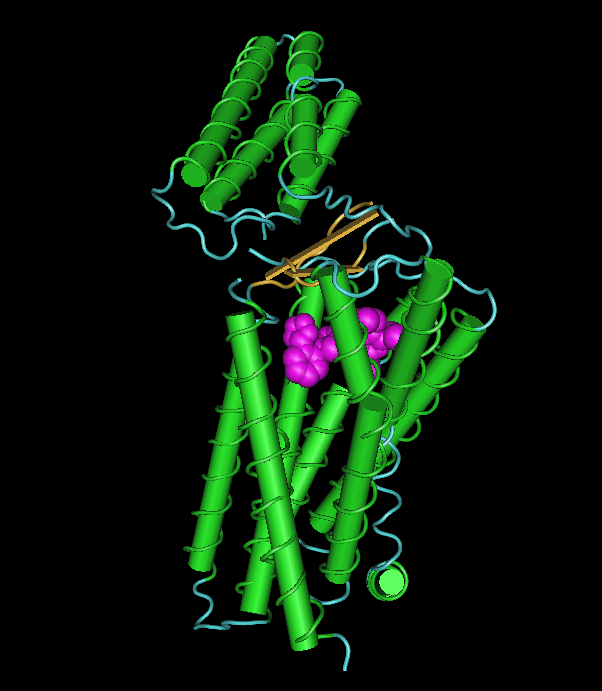 You can, however, see how the ligand fits in a binding pocket in the transmembrane domain with its numerous helices. The domain on top is a extracellular domain. The structure should help to resolve questions concerning the regulation of blood pressure, how mutations influence the binding of angiotensin II and may help to develop other drugs. This is a very nice piece of work. Highly recommended! Reading about circadian rhymth in flies I happened to see the Neuron paper by Gandhi et al. about melatonins role in fish. Melatonin – the hormone of the pineal gland – has been shown already to be active in the determination of seasons, its amount produced during the night being measure in so-called calendar cells in the vicinity of the hyphyseal stalk. Now the authors in Pasadena show that melatonin is necessary to fall asleep: zebrafish without the critical enzyme of melatonin systhesis: aanat2 (arylalkylamine N-acetyltransferase 2) take much longer to fall asleep and do not sleep as long as control animals. Whether the data do apply to men and mammals is open. This is, however, a nice piece of work. It does not explain while I can start sleeping extensively during day time when there is not any melatonin in my circulation.